Tsunami Effect is a story about the healing power of compassion. It is the chronicle of a trauma recovery project in South India following the 2004 Asian Tsunami, one of the greatest natural disasters in modern history. Told through the narrative of project director Timothy L. Trujillo, it is a tale of discovery in the midst of realizing a mission to reduce suffering. Infused with the flavors, colors, and spiritual mysteries that are the fabric of India, it could be subtitled, “Eat, Pray, Heal”. Through multiple ‘on-the-ground’ case reports, Trujillo portrays the remarkable ability within individuals to recover from life-challenging trauma and profound grief. As a pilot project to demonstrate the effectiveness of mind/body therapies, it is a story within a greater odyssey to take the same methods that have helped people with HIV/AIDS in Los Angeles to the entire world. He follows up the India story with review of responses to other disaster events since and how they are shaping our understanding of the impact of overwhelming circumstances and methods of coping with post-traumatic distress. 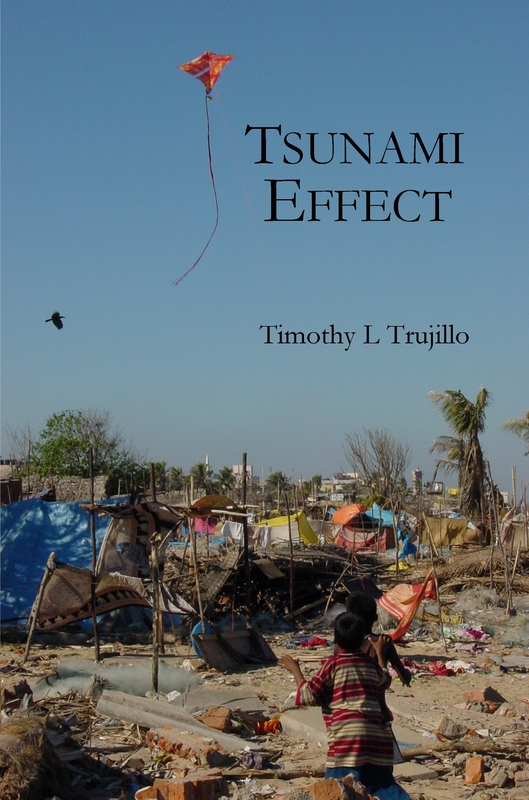 Tsunami Effect is a must-read for anyone who has ever wanted to make a difference. “A sudden slip in the fault line between the India and Burma Plates had caused 700 meters of ocean floor to drop sixty feet. The shock, with the force of a ten to twenty kiloton explosion, jolted the globe and caused the day to be almost three seconds shorter. The massive “kerplunk” as the ocean floor dropped, displaced billions of gallons of water and created a ripple from bottom to surface, radiating out at 500 miles per hour. During the treatment, a movement in the corner of my eye drew my attention away, toward the sea. I had been aware of the rolling surf since we arrived, but this wave seemed a bit taller than the rest. It seemed that it had a greater force as well. I felt a shudder within and a terror that this wave was different. This wave seemed as though it would not stop at the shore, but overwhelm the sandy beach and crash directly upon us. Maintaining contact with the man, I turned my attention fully to the wave, responding to the inner alarm to assess our risk. Soon I saw that the wave was shrinking. Though it was a large wave, it was not a great wave. It broke and rolled upon the beach as each wave before and after. In my moment of terror, however, I came to understand the fear our friends were facing. There was an innate concern that another wave would come and as surprising as the last, would finish the destruction left undone. Now I began to understand this ‘tsunami terror’. It was something inside, something anticipatory that looked for outer signals to confirm it. I exhaled, released my tension through the soles of my feet, and returned my focus to this aged infant in my hands.